One of my pet peeves of this game from YEARS ago was the inability to repair tracks on a tank. Driving a tiger from a back town (because we didn't have brigades in those days), having to drive the whole way because warping it at a FB would make it available to anyone browsing the vehicle list, meeting up with others in the attack and then finally moving as a column to town, only to be tracked crossing an open field just out of visibility of town and unable to provide any support. This was frustrating as this perfectly good vehicle was wasted as there was no way to repair the tracks. This sortie was probably back in 2007ish (I can't remember exactly). When I rejoined this game early last year (ish) one of the first things I had hoped was added/fixed was the track repair option but alas, it's still not in game. Suggestion 1: Have the tank carry 1, track repair kit. If you end up being tracked, and you're not currently fighting, you can activate the track repair. This process takes time, 5 minutes? 8? 10? During this time, a progress bar appears on your screen and you cannot switch positions, shoot or do anything. If you take damage, the progress bar is cancelled (like placing a FMS). Perhaps, the tank will show something in 3rd person to show it's being repaired (so that friendlies and enemies alike know that you're not able to shoot). This track repair kit can be resupplied by a standard ammo resupply (e.g. truck, ammo cache etc). Suggestion 2: Have a truck/half track "perform" the repair. They have to be within ammo resupply range and then the tank can activate the repair. Again taking time, 5- 10 minutes, during this time, the tank is unable to shoot, change positions etc. If the truck dies, then the progress is reset. +1 to this, something I too have been wanting to a long while. I would go with suggestion 2 just to give trucks something more to do. +1 Needs to be looked at again. A system that also replaces a downed crew or allows you to keep fighting also has to be implement. In RO2 you have your surviving crew moving from position to position, In warthunder they keep getting replaced with the other crew members once you are down to one crew you loose the tank. 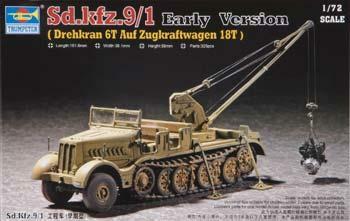 Maybe model the Sd Kfz 9/1, and allow it to repair tracks, have a couple per regiment. Or just model the Sd Kfz 9, it could transport the repair crew out; or be used as a towing vehicle or MS.
An addition of "track repair" and "crew member replacement" or position movement would have the effect of nullifying a significant percentage of tank kills, thus affecting both tank combat outcomes and the intermodal balance vs. other unit types that have the potential to kill tanks. In particular, units with less combat power than a given tank, but some degree of ability to break a track or kill a crew member, no longer would be as able to put an opposing tank out of action. This would strengthen the tanking game vs. other game elements, and strong tanks vs. light tanks, ACs, light AT guns, aircraft, etc. Aircraft players complain regularly that it's too hard for them to kill tanks, because bombs in many cases won't do more than break tracks. If even that went away due to repairability, it's reasonable to surmise that air players would be peeved . The justification for not providing track repair in the past was that it should tank far longer than tank players want it to take. It also should involve the tank crew getting out and being exposed to enemy light weapons, fragments, etc. for that (longer) repair period. Position switching would veer the game toward unrealism. Except for an unbuttoned commander, the death of any other crew member almost always entailed enough damage to the tank that the crew would abandon it...and tank abandonment due to the death of the commander was the norm as well. I'm not so keen on the position switching, if the driver or gunner is dead, then a kill is awarded and that's it. If the commander is dead, drive back to base and RTB. As is if the engine is dead or the gun disabled a kill is awarded and the vehicle won't go back into supply via a RTB/RES. A tank with a disabled track is not going anywhere. If it's near town, then repairing it is risky. The tank can't defend itself while repairing and is vulnerable to sappers, atgs, shreks/zooks/rpats etc. If a bomber destroys one track, then the bomber won't get a kill for that anyway but it will stop the tank from advancing. Now everybody knows the position of the tank (because it's been marked right?) and the defenders can work on taking out the tank. As modelling new equipment takes time, using an existing truck would work here. The truck is easily killed, the tank can't move it's turret or shoot while repairing. There is risk for the tank. I'd agree to fixing 1 track, as currently 1 track is not a kill, where as double tracked is, so shouldnt effect any stats or scoring, and it should take a decent amount of time.